North Wales is a long way from London (but not so far from Manchester and other points in the north). Llandudno is arguably the capital and 250 miles from Marble Arch. The M1, M6 and M54 make for easy going at first and a dual carriageway follows until Wrexham and then it gets worse and worse along hilly single lane roads. But at least the scenery is magnificent. An alternative southern route takes you through the Snowdonia National Park, simply wonderful views. Reckon on five hours including a 30-minute stop. An alternative routing might be Virgin Rail and the hire of a car at the other end. Train fares can be very cheap and vehicle rental likewise. Euston to Llandudno Junction is around 2hrs 50mins and a departure every hour. We took a two-night break but would suggest a week to fully appreciate some of the finest scenery in the United Kingdom and true local hospitality. We stayed at Bodysgallen Hall, just outside Conwy with its famous Telford bridge and historical castle. According to tradition, the site of Bodysgallen was the 5th century AD stronghold of Cadwallon Lawhir, King of Gwynedd, who had wide ranging exploits as far as Northumberland. 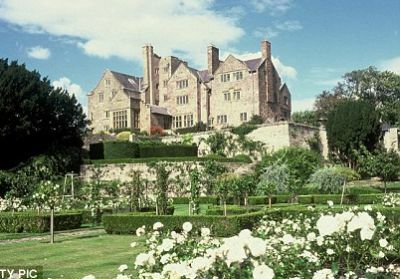 Today it is one of three National Trust historical hotels (see BTN 3 March 2012). It is a Grade I listed building which makes its running as a hospitality unit not that easy, but the ‘AA Hotel of the Year for Wales 2012-2013’ says it all. You are made very welcome in a truly wonderful setting. North Wales is full of railways, some part of the national network, and others restored tracks and the remnants of long disused slate and coal works. Perhaps the most famous are the narrow gauge Snowdonia Mountain Railway and the Ffestiniog Railway. 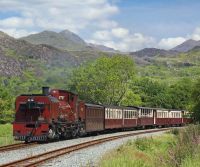 We chose to take a ride on the Ffestiniog’s sister operation, The Welsh Highland Railway, steam driven and 26 miles of fantastic scenery in the National Forest. It is not very fast but it chugs along beautifully. You can go from Caernarfon to Porthmadog (and back) but we chose to join at Rhys Ddu, a village with a pub about half way along, and easy parking. 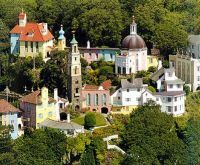 Whilst there is the remains of a medieval castle in the extensive grounds Portmeirion is essentially a living memorial to the architect Sir Clough Williams-Ellis who, from 1925 onwards, constructed a fantasy tourist village on a site overlooking the wide River Dwyryd. “Clough” as he was always known died in 1978 but not before persuading influential people, such as the Prince of Wales, on the value of the project not only as a wonderful tourist location but also the repository of Victoriana that otherwise might have been destroyed. The Bristol Colonnade and the Town Hall (rescued from Emral, Flintshire) are typical. Portmeirion has served as the location for numerous films and television shows, most famously serving as The Village in the 1960s television show The Prisoner. Visitors will find numerous buildings and structures to investigate. There is a continuous 40-minute video show with Clough as the compare, wearing distinctive yellow socks. New for this year is the Forest Train, all part of the entrance fee, which takes visitors as far as an area known, for obvious reasons, as the Japanese Bridge. It takes 20 minutes or you can get off and pick it up next time around, or walk back. 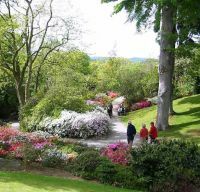 Close by the A470 Llandudno – Betws-y-Coed road lies Bodnant Gardens, still the home of the Dowager Lady Ann Aberconway, the majority now a National Trust property covering 80 acres above the River Conwy on ground sloping towards the west and looking across the valley towards the Snowdonia range. For the first time the gardens will be open during the winter which should make for some spectacular views. Parking is across the road and there is a pedestrian underpass. The on-site café was excellent and there is a fine garden shop. 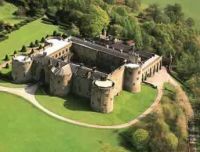 Just outside Wrexham is Chirk Castle, a fine National Trust property, magnificently perched on top of a hill. It was started in 1295, one of a series of fortifications built to protect the North West from the Welsh Kings. It is not that well signposted, but is only a 30-minute walk from Chirk railway station. Allow another 15 minutes for the steep climb from the entranceway, farm shop and countryside display room. The Castle is very well preserved and built around a rectangle. In the Civil War its then owner Thomas Myddelton was a Parliamentarian who refused to use cannon against the building when it was held by the Royalists. Cromwell was not for him and he changed sides supporting the return of Charles. The Myddelton family retained a private suite in the castle until 2005. They are not related to the Duchess of Cambridge.